Register Log In ECN Forum Forums Photos for General Discussion GFCI Needed Here? 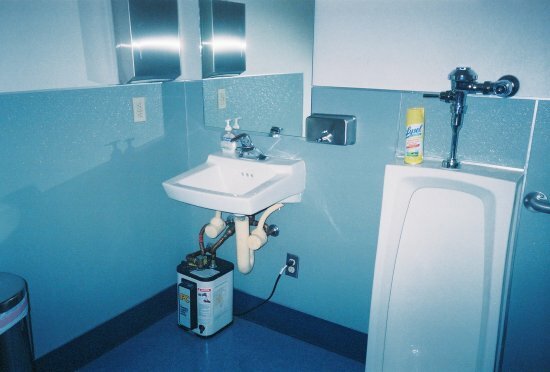 Bathroom convenience receptacles must be gfi-protected. Water heaters typically are not. For the sake of discussion, would you REQUIRE the water heater receptacle pictured to be gfi protected? It is well below the sink, and there is another receptacle adjacent to the sink. Would your opinion be affected if the WH receptacle was inside a cabinet? I would require that a GFCI was put on any outlet in a bathroom, regardless of wether it was in a cupboard or not. NEC says "All" bathroom receptacles. GFCI for me too John. I'm with everyone else here, the NEC says if the receptacle is in a bathroom, it "shall" be protected by a GFCI. Although there probably isn't one... I would look for an alternative location for that WH. GFCI. There is no exception for a dedicated receptacle for a specific use item in bathrooms (like there is in garages for that extra freezer). Is it OK to cord and plug connect a water heater? The way it is now (accessible & duplex)? "Cal-rod" metal-sheathed heaters and GFCIs can be a troublesome combination. Replacement of the cord and lower receptacle with fixed wiring might make better sense. Recessed single gang box, single gang, water proof extension box with sealtite, strapped and connected directly to Water Heater.